DesignFreeQ documents consist of a number of sheets. Each sheet has one or more views. Views contain models, which represent the 3D geometry. Geometry elements can be placed on different layers, models are shared across different views, allowing you to create sheets with multiple views, each looking at your models from a different perspective. All that is like you know it already from other major CAD packages. The tool palette on the left of the document contains all tools you normally work with. The most prominent tool in a category is placed at the top palette slot. For some tools, holding down the mouse button on a palette icon pops up a submenu with related tools. A second tool palette for dimensioning is available from the dimension menu. The most outstanding feature of DesignFreeQ is its Inference Engine which lets the cursor snap to those points of the geometry you are really interested in. Dynamic construction lines appear as needed to help you find, for example, intersection points or tangent conditions to a circle. This works in 2D and 3D as well. No explanation for that is needed, just try it out, it works like you would expect. Feedback boxes at the bottom of the document allow you to enter exact values for geometry you are about to create. For example, after creating a line at exactly the spot you want it, you can set its length in a feedback box. Feedback boxes are used to set the initial values of an entity, while the Edit Objects dialog is for editing them later on. The dimension palette bundles all tools related to dimensioning your design. Dimensions go hand in hand with parametrics. 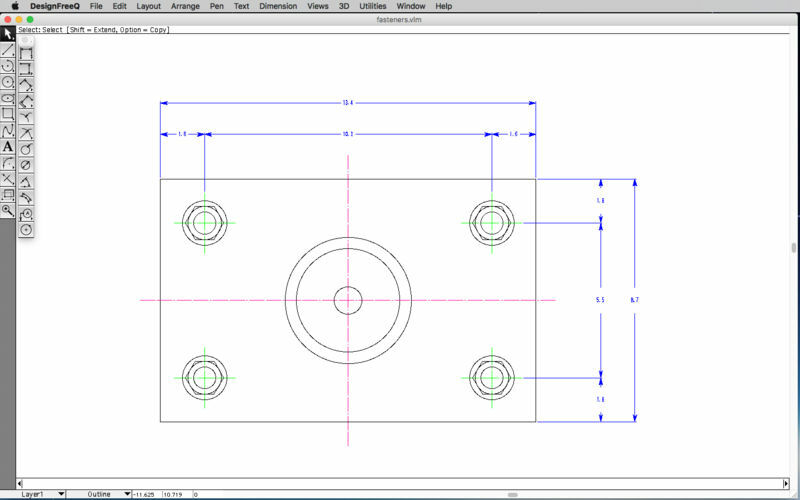 Simply specify variables for the dimensions and provide numeric values for them later, once you resolve the design. Each design saved as a .vlm file can become a parametric symbol if you, instead of opening it through the “Open…” menu, load it as a symbol via the “Symbol…” menu. DesignFreeQ is compatible to the CAD applications Vellum and Draftboard. Compatibility with older CAD programs like AutoCAD is achieved through DesignFreeQ’s DXF and DWG import and export capabilities.